The title song alone is a celebration and a reminder of a time when the simplest pleasures mattered most and having a big heart was genuinely considered a virtue. Two successful showmen join forces to help out their old army commander. Along the way they find, lose and find romance, have plenty of laughs and demonstrate what it means to be loyal. 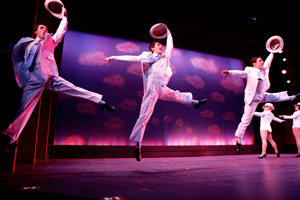 The score is filled with favorites—”Happy Holiday,” “Sisters,” “Blue Skies,” “I’ve Got My Love to Keep Me Warm”—and the choreography calls for plenty of tap. Based on the Paramount Pictures film, with music and lyrics by Irving Berlin, the Syracuse Stage production of “White Christmas” is directed by Paul Barnes (“The Miracle Worker,” 2011) with musical direction by Christopher Drobny (“Caroline, or Change,” 2012) and choreography by David Wanstreet. “White Christmas” runs through Dec. 30 in the Archbold Theatre at Syracuse Stage, 820 E. Genesee St. Tickets, $30-$54 for adults and $20 for age 18 and under, are available at the Syracuse Stage Box Office, 315-443-3275 or www.SyracuseStage.org. Patrons visiting Syracuse Stage this holiday season are asked to please bring a nonperishable food item for the food pantry at Grace Episcopal Church. Suggested items: grits, pancake mix, dried beans (pinto, lima, great northern and black-eyed peas), canned vegetables (no-salt-added corn, green beans and peas) and spaghetti sauce. Syracuse Stage season sponsors are The Post-Standard and Time Warner Cable. Sponsors for “White Christmas” are Excellus, Key Bank, Hiscock & Barclay and Welch Allyn; and media sponsors are Eagle Newspapers, Syracuse.com and WCNY. “White Christmas” is coproduced with Syracuse University’s Department of Drama. With 175 costumes, 900 costume pieces and 125 shoes outfitting a cast of 30, “White Christmas” is one of the largest and most visually spectacular productions to date at Syracuse Stage. As with all Syracuse Stage productions, everything appearing on stage has been created by resident, local artists in the scene shop, costume shop and props shop, and in the areas of lighting and sound. Featured in the cast of “White Christmas” are eight professional actors with significant Broadway and regional theater credits: Zakiya Young as Betty Haynes (Broadway: “Stick Fly,” “The Little Mermaid”; Regional: “Aida” at the Kauffman Center in Mo. ), Denis Lambert as Bob Wallace (National Tour: Phil Davis in “White Christmas”; Elvis Presley in “Picasso at the Lapin Agile” at Syracuse Stage), Craig Waletzko as Phil Davis (Broadway and National Tours: “Guys and Dolls,” “Young Frankenstein,” “Spamalot,” “Steel Pier” and “Gypsy”), Mary Michael Patterson as Judy Haynes (Broadway: Hope Harcourt in “Anything Goes”), Mary Jo Mecca as Martha Watson (Regional: “Superior Donuts” at Geva Theatre Center, “Little House on the Prairie” at the Guthrie Theatre), John Shuman as Ezekiel Foster/Snoring Man (Broadway: “La Cage Aux Folles” and “13 Rue de L’Amour”), James Van Treuren (Broadway: “The Scarlet Pimpernel”; “Caroline, or Change” at Syracuse Stage) and Duke Lafoon as Ralph Sheldrake (“It’s A Wonderful Life” at Westchester Broadway Theatre, “Monica the Musical” at Manhattan Theatre Club). A 20-member ensemble, comprised of students from Syracuse University’s Department of Drama, portrays additional characters and is featured in several large-scale dance and choral numbers. Completing the cast is local, 13-year-old actress Jacqueline Baum as Susan (last seen at Syracuse Stage as Helen Keller in the 2011 production of “The Miracle Worker”). “’White Christmas’—the song, the movie, the stage play—reaches an audience in many, many ways. It’s a beautiful story. I’m particularly drawn to it under what I think of as the two large umbrellas that encompass ‘White Christmas.’ One has to do with what happened in WWII: a general who was heroic in the extreme, and now has fallen on hard times. So much of the story is about getting the men to come to his aid, which they do,” says Barnes, the director. At the heart of “White Christmas” is the title song. “White Christmas” was first sung by Bing Crosby for the 1942 film “Holiday Inn.” Irving Berlin expected another song from the film to be the breakout hit. However, when Armed Forces Radio included “White Christmas” in its rotation, the song struck a chord with GIs spending their Christmas overseas. “White Christmas” won the 1942 Academy Award for Best Song of the Year and is the most recorded Christmas song of all time with more than 500 different cover versions by varied artists such as Kenny Rogers, Babyface, Gloria Estefan, Michael Bolton, Willy Nelson, Garth Brooks, Hanson, Mandy Patinkin, Destiny’s Child, Brooks & Dunn, Barbara Cook, Bette Midler, The Vienna Boys Choir and The Flaming Lips. Bing Crosby’s version is considered the standard, having sold more than 100 million copies worldwide.